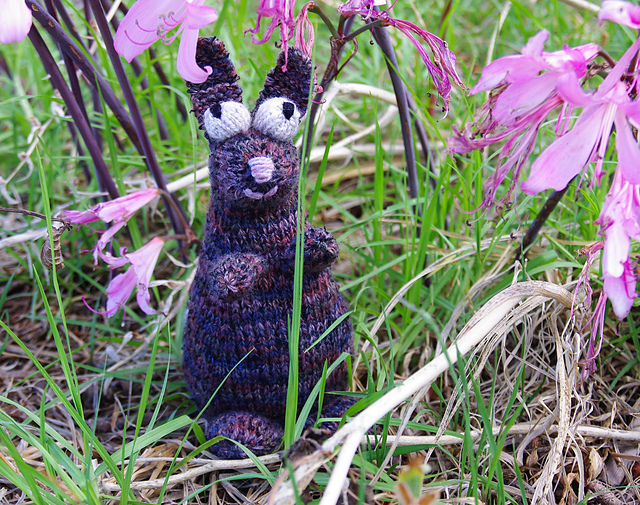 So the KAL / CAL theme for the Womans Weekly group on Ravelry for March was Mad March Hares - make a rabbit / bunny! I didn't need a lot of encouragement. I love me a good knitted toy and haven't made one for a while (if you don't include the great sew-up-a-thon of unfinished toys I undertook in January). But just what bunny to make? 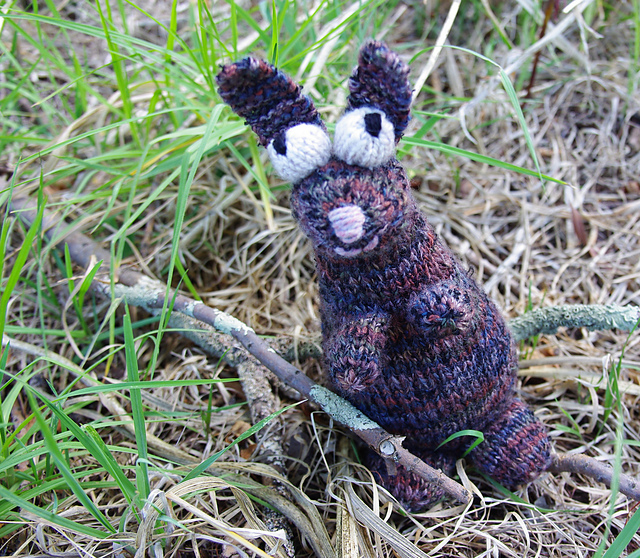 There are so many cute ones out there (and that's probably the ideal theme for a future curating Ravelry post). I looked through my physical pattern stash (lots of books and magazines) and briefly contemplated Alan Dart's Bunny Babes and Beach Boys or Debbie Bliss's Sleepy Bear in a Rabbit Suit which I have made once before as baby shower present. But then I thought half the fun of playing along in KALs is trying something you wouldn't normally do or being encouraged and supported to try a new technique. And so I thought, I've never knitted a toy in the round. And then I knew the ideal pattern to make... Rabbitty. Here is the beginning. 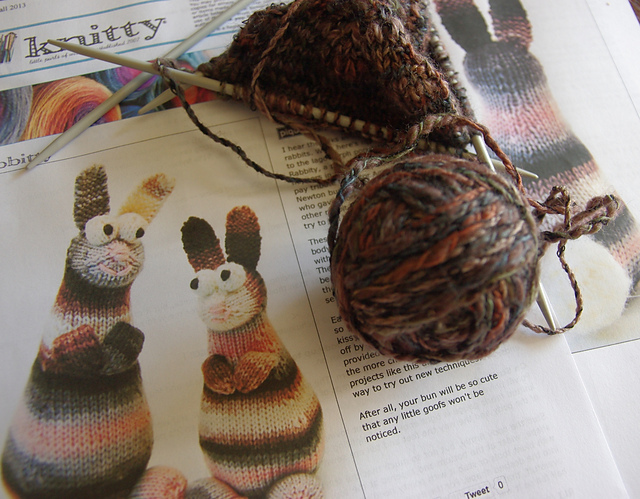 Rabbitty is began from the bottom up and knitted in the round with short row shaping to create the head and neck. I really like the end result and it was a really quick knit (with the bulk of it being knit in two days) but I don’t think it will become my preferred method. There are two major issues with making a toy this way. It’s really fiddly to knit a small number of stitches on dpns especially at the beginning of a piece of work. And even more so when you are knitting using a boucle wool. When I was knitting the feet, I’d get half way through the second shaping round and half the stitches would slide off one of the needles I wasn’t using and I’d have to start all over again. Also stuffing the body and then having to knit the last two rows means then you have to be careful not to knit the fibre-fill into the knitting! 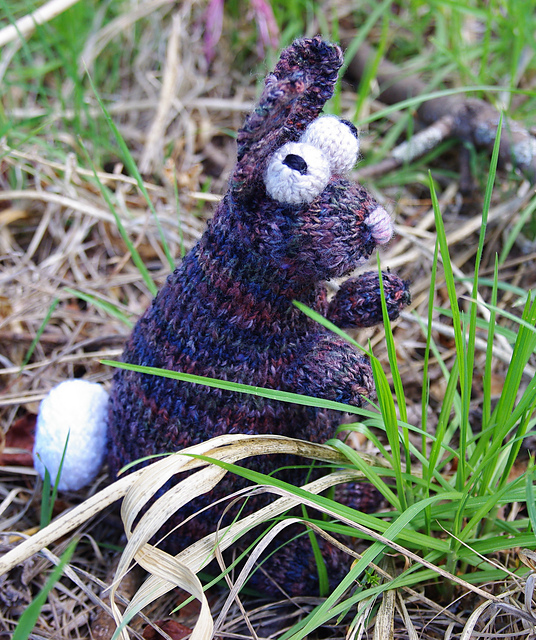 Pattern: Rabbitty by Cheezombie. Free pattern from Knitty First Fall 2013. Yarn: Body: Aran 10 ply worsted weight thick and thin multi-coloured boucle from the op-shop - brown, grey, blue, green and black. Tail: 8ply fluffy white snowflake-like baby wool from stash. Eyes: Cleckheaton Country Naturals cream from stash. Oddments of black and pink yarn for eyes, nose and mouth. But he is so cute! (It's all in the eyes!) 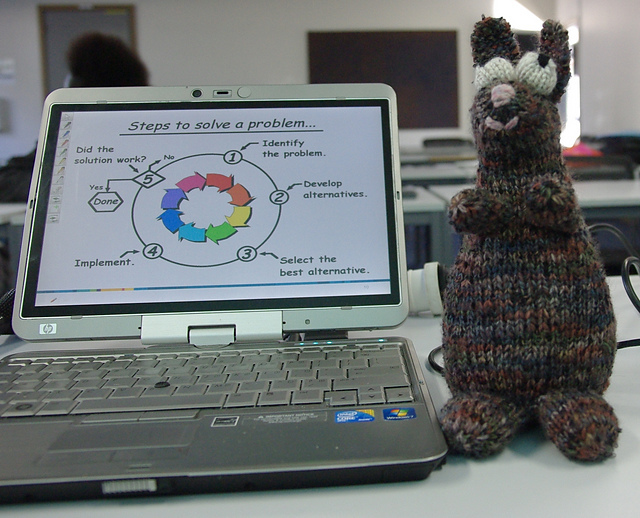 Rabbitty is also an accomplished maths bunny. Bunnies are inherently mathematical. They are great fans of Fibonacci. He's being following me around, helping me teach classes and getting photographed in odd places and appearing on Twitter and Facebook. He's my new mascot bunny. 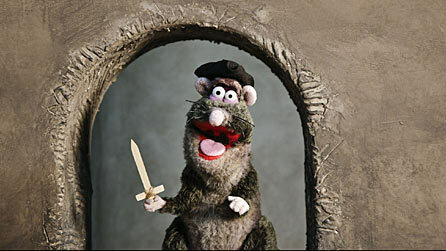 My husband reckons that he looks like the rat from Horrible Histories. I'm choosing to ignore this very valid comparison. I have some more weird mystery wool. I might make another one. After all one bunny is lonely.